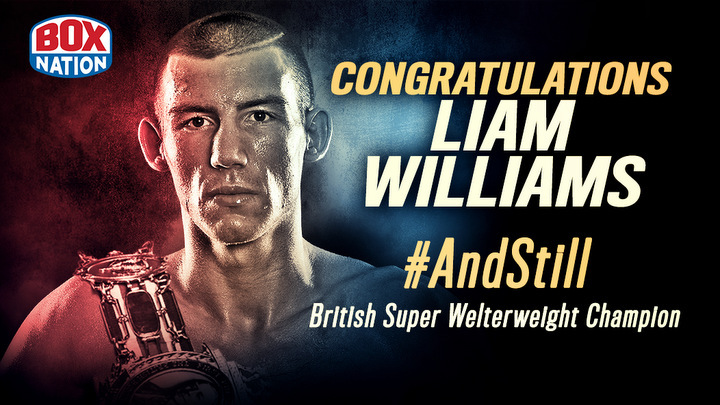 Welshman Liam Williams (15-0-1) produced a dramatic 11th round stoppage of Londoner Gary Corcoran (15-1) to retain his British and Commonwealth super-welterweight belts. The pre-fight animosity between the pair resulted in an enthralling contest that swung back and forth, but Williams’ vocal support were eventually rewarded after an emphatically-delivered right hand in the penultimate round that signalled the beginning of the end for the valiant Corcoran. The bout was just seconds old when Williams picked up a cut on the bridge of his nose, but that didn’t stop the Lonsdale belt-holder from reeling off jabs and then bringing the crowd to life with a huge overhand right that had Corcoran clinging to the ropes. There were harsh words exchanged on nearly every bell before the pair were meant to walk back to their opposite corners; referee Terry O’Connor was particularly scathing towards the challenger on those occasions, perhaps a little unfairly at times. By the fourth round, both fighters were bleeding, each wound opened up by head clashes, the Londoner coming off worse prompting the doctor to take a close inspection, fortunately confirming that Corcoran was fine to continue. The mid-rounds saw a lull in the home fighter’s work-rate as he visibly took his foot of the gas, allowing his challenger to press forward and dominate. There was controversy in the eighth when Corcoran, who was frequently at odds with the official, was deducted a point for pushing his man down. Sensing he had an advantage on the scorecards, Williams was content to select shots from range and smother Corcoran up close. That left Corcoran looking for a stoppage but as he lunged in halfway through the penultimate round, he was felled by a thundering right-hook counter. The tough visitor wasn’t going anywhere quietly and leapt to his feet for more but after slipping to the canvas again, rose to take one more crashing blow that brought in the referee to end the thrilling contest. After the result was officially announced, the two eventually embraced, although it was clear that the pair still harboured genuine dislike for each other. Post-fight, it emerged that that 25-year-old ‘Hellraiser’ from Wembley badly damaged his left hand midway through the contest, hampering his chances. The grudge match lived up to its hype and many pre-fight antics, and the door is firmly open for a rematch, perhaps this time in the English capital. Pound-for-pound superstar Guillermo Rigondeaux (17-0) marked his UK debut with a second-round stoppage of Liverpool’s Jazza Dickens (22-2), doubling the Merseyside man’s loss ratio. The enigmatic Cuban retained the WBA Super World super-bantamweight title when Dickens’ corner rightfully withdrew their man with what appeared to be a broken jaw after he sustained the cleanest of overhand lefts. Terry Flanagan (31-0) kept hold of his WBO world lightweight title and unbeaten record but was taken the distance by 42-year-old veteran Mzonke Fana (38-10) who has clocked up over 400 rounds in his 22-year-long professional career. Flanagan had been favoured to dispatch his South African opponent inside the distance but found the former world champion an awkward and frustrating proposition even though earning scores of 120-106 on all three judges’ cards. Bradley ‘Super’ Skeete (24-1) produced a seventh-round stoppage of Frenchman Alexandre Lepelley (19-7-1) to retain his WBO European welterweight title. The Londoner was in typically patient form but pounced on his chance to end the contest having initially felled the challenger with a shot that may have strayed low. Earlier on, Commonwealth super-flyweight champion Jamie Conlan (17-0) enjoyed a rare routine night as he dispatched Patrik Bartos (7-10) in two; and super-welterweight prospect Joe Pigford (11-0) took less than four to halt Sam Omidi (4-3-1).